Refurbishment work has begun on restoring a prominent and historic landmark on Tooting Common, thanks to National Lottery players. 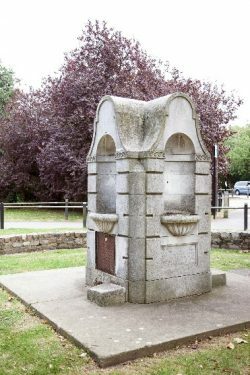 The 1930s drinking fountain is being cleaned, repaired and brought back into public use, as part of a wider scheme funded by the Heritage Lottery Fund (HLF) that’s designed to breathe new life into some of the common’s most important features. The common covers 220 acres and is the largest open space in Wandsworth. It has been designated a Site of Importance for Nature Conservation – and is ranked in the top tier of these protected spaces – a site of Metropolitan Importance. The HLF-supported project will also provide new acid grasslands, renovate the lake, restore the Woodfield Pavilion to offer toilets and meeting space for local community groups and pay for extensive refurbishment work at the popular Tooting Bec Lido. As well as restoring ancient habitats and boosting biodiversity, the scheme is also offering new volunteering opportunities for local people that not only improve the common but give those who take part useful new job and life skills. The project is a closely linked partnership between the Council and local groups like the Wandsworth Historical Society, The Woodfield Project and the South London Swimming Club who all have a shared interest in preserving and protecting this important green oasis and are taking forward their own individual schemes. Wandsworth Council’s Tooting Common Heritage Project is funded by the Heritage Lottery Fund and is being delivered by Enable Leisure and Culture in partnership with South London Swimming Club, idverde, the Tooting History Group, Wandsworth Historical Society and The Woodfield Project. For more information please email skryuchenkova@wandsworth.gov.uk. Thanks to National Lottery players, we invest money to help people across the UK explore, enjoy and protect the heritage they care about – from the archaeology under our feet to the historic parks and buildings we love, from precious memories and collections to rare wildlife. Visit www.hlf.org.uk or find out more via Twitter, Facebook and Instagram and use #HLFsupported.